As I write this (15 October), the fourth annual meeting of the Network for Public Education is coming to a close. NPE is a national group dedicated to fighting for local public education, and was founded just a few years ago by education luminaries like historian Diane Ravitch and teacher/writer Anthony Cody. The meeting, in Oakland, CA, drew hundreds of education advocates from all around the country and featured panels on everything from building advocacy coalitions to the role of technology in education. It seems to me, though, that one thread running throughout the conference was the need to continue to address issues of race and class in the struggle over the future of public education. Perhaps this thread stood out to me more prominently because on my journey here I had been reading a new book by my good friend Pamela Grundy: Color and Character: West Charlotte High and the American Struggle over Educational Equality (Univ. of North Carolina Press). Her history of segregation, successful desegregation, and eventual re-segregation in Charlotte, NC has a lot to tell us about the issues we face all over the country today. You might think that description strange, unless you attended the panel entitled "School Integration: Changing the Conversation," put on by Grundy (a Charlotte, NC parent), Courtney Mykytyn of Integrated Schools (a Los Angeles parent), and Diallo Brooks of People for the American Way (a Washington, DC parent). Their discussion highlighted both the continuing burden of racism and segregation on our schools and the difficult road ahead as we try to heal that old wound. This theme was even more bluntly underlined in the discomfiting closing keynote by New York Times journalist Nikole Hannah-Jones, who spoke on why integration was an essential part of any effort to preserve and strengthen public education. (See a video of her speech here.) Hannah-Jones reminded us that it was precisely the neglect of the schools and living conditions of low-income children of color which opened the door to the "reform" movement we have all been fighting. Arguing that the "solution" offered by the education privateers is no solution at all - that is common ground for all of us. But arguing that everything was just fine before this debate started willfully ignores the reality of so many of our low income communities, urban and rural. So where is the connection, exactly, between the current fight over public education and our nation's sordid history of de jure and de facto segregation? Just this: separate is still inherently unequal (as held by the US Supreme Court in 1954); we are far from having shaken off the weight of history; and "choice" sometimes brings out the worst in us rather than the best. Start with the fact that the residential housing patterns of today still reflect mortgage "red lining" from the 1930s, especially in northern cities. These patterns, which reflect both ethnicity and class, shape our local schools, which without concerted effort serve to replicate the divisions seen in our communities. White and middle class flight from large cities, sometimes driven by race-based opposition to school desegregation orders and plans, exacerbated these divisions. 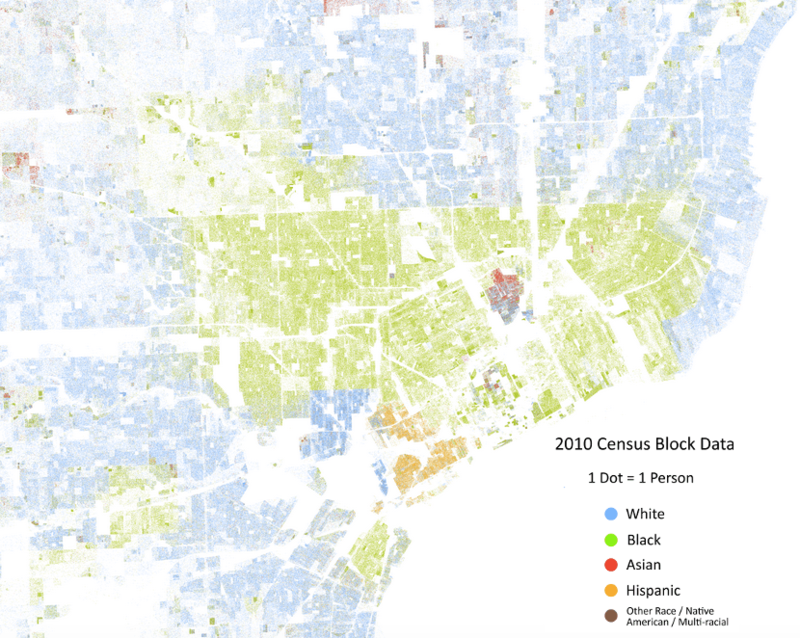 One look at the pattern of residents by race on either side of 8 Mile road in Detroit - which happens to mark the northern boundary of both the City of Detroit and the Detroit Public Schools district - is extremely instructive. 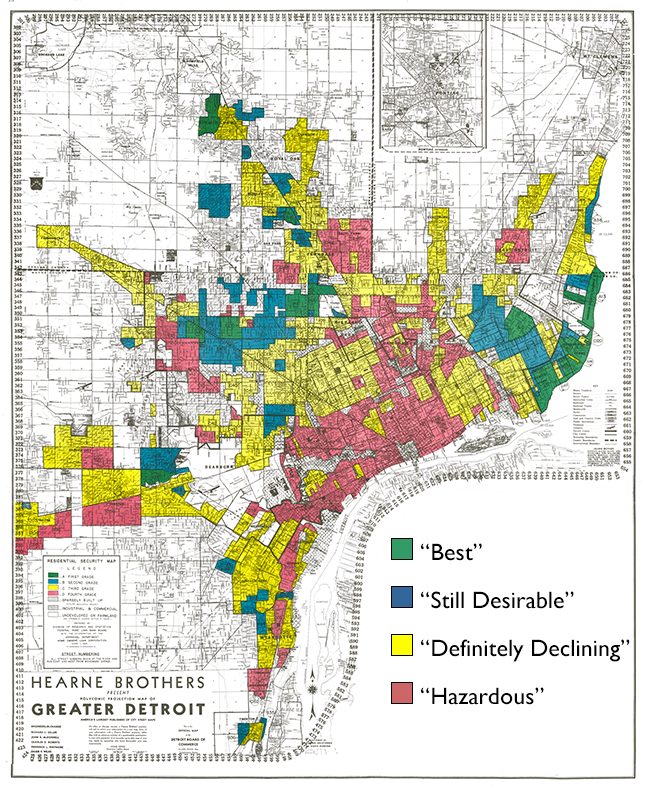 Modern day Detroit is more segregated than it was in the 1930s. But, you might say, even if schools aren't all integrated, at least everyone is getting the same resources, right? Well, no. Historically, schools that served low income families and African American (and less "desirable" immigrant) neighborhoods received far fewer resources than their wealthier, and whiter, counterparts - even within a single school district. Since residential patterns often persist, this means that some areas and communities are still feeling the effects of decades of poorly-resourced and neglected schools. On top of that, until relatively recently, school funding was supported almost entirely by local property taxes. Districts with low property values had less money, despite often higher tax rates, than districts with stronger tax bases. This circles back to those 1930s maps, where judgements about neighborhoods controlled access to home mortgages and thus became self-fulfilling prophecies as struggling neighborhoods led to poor schools which led to further neighborhood struggle. For urban school systems, this was exacerbated by white and middle class flight to the suburbs in the post-war years. For many who sought judicial remedies to inequality and segregation (when our nation's courts were willing to contemplate such a thing), this was the practical aspect of desegregation. Only when white and black children were educated in the same schools, they argued, would the political will be found to make facilities equal. Sadly, they were proved right more often than not. So, wouldn't evening out school spending solve that problem? After all, Michigan's school funding system is designed to close the funding gap between districts over time (and the vast majority of students now get the same per-pupil funding). Well, first of all, you'd have to overcome the effects of decades or centuries of inequality, and that does not happen quickly. Children who are worried about having a place to live, or about whether there will be something to eat at home, do not magically become as "ready to learn" as their more secure classmates when they pass through the school doors. Nor can schools, by themselves, totally reverse the impact of poverty on children, even with supplemental (but nearly always inadequate) funding for "at risk" children. When long-term poverty stretches over generations, the difficulties multiply. Equality is not equity. On top of that, school communities where families have had access to stronger education and have more resources can more easily advocate for themselves in local resource allocation decisions. These parents are also more able to fill the gaps left by education spending policy - it has become the primary focus of just about every PTO and PTA in the state. In a state such as Michigan, where education funding has been lagging actual needs for more than a decade, the question is not so much equality of funding as adequacy of funding - a point recently made in the state's school funding adequacy study. In other words, just as poverty and racism creates a destructive cycle, affluence and privilege can drive a self-reinforcing cycle as well. But perhaps more importantly, can schools that are exclusively of one race or class ever be made truly equal? That was the core of the Warren Court's decision in Brown v. Topeka: that a central goal of public education was to mold future citizens, and attending schools separated by race or ethnicity would never successfully prepare children to be the kind of thoughtful citizens we need for a robust and diverse democracy. This argument remains true whether that segregation is by law, by custom, or "voluntary." Public schools are supposed to serve the public interest; is it ever in the public interest to educate children who have no experience with people different from themselves? And that brings us to school choice. Who doesn't like choice? Then-Florida governor Jeb Bush likened school choice to selecting a kind or flavor of milk at the grocery store in his 2012 Republican National Convention speech. More recently, US Secretary of Education (and half of Michigan's billionaire power couple) Betsy DeVos likened it to choosing among food carts. There are a lot of problems with these metaphors, not least that consumers don't get to decide what kind, or quality, of milk is made available; not everyone is able to reach every store; and it's not as easy to spot a poor education as it is to smell spoiled milk. If you get a bad bratwurst from a food cart, it's not likely to have a lasting impact on your future. There is another angle to this, though. What happens when each store sells only one kind of milk? The folks who are most comfortable with skim always go to one store, and those who prefer strawberry always go to another. The conversations they have in the checkout lines are always with people just like them. It feels comfortable and safe. But does it prepare you to function in a world where all kinds of milk drinkers have to come to agreement on issues of common concern? Does that foster the kind of mutual understanding that a democratic system requires? People can always disagree, but if they cannot even understand each others' concerns, if they view each other as alien creatures who are beyond comprehension, then democratic processes break down and lasting damage can be done to a society. Research study after research study is indicating that our schools are becoming more segregated, as local schools begin to reflect segregated housing patterns once again. But families who send their children to charter schools, which have no defined attendance area, are on average enrolling them in schools which are even more segregated by race and class. To a lesser extent, policies which allow students to transfer between school districts are having a similar effect. Most families are simply choosing what feels most familiar, or reassuring; some may be explicitly seeking refuge from "them," whoever "they" might be. Supporters of this kind of "choice" system, of what some at the conference were calling "schools of exclusion," usually respond by saying that parents are choosing to go to separate schools. But should we, the people, be funding segregated schooling just because it's what some parents appear to want? We all want "the best" for our children, but perhaps we need to take a close look at what "the best" really means. It might mean, instead, a wider variety of backgrounds, languages, or traditions. As the Warren Court held, maybe diverse schools aren't just a "favor" done for some children but really are better for all children. And this, finally, brings us around to the reason why tackling race and class is essential to the effort to preserve and strengthen community-governed public education. What we have right now in this country is a fundamental split over the very purpose of education. For some, education serves solely to improve the future prospects of our own children. Whether it benefits others or some greater good is largely irrelevant. But for others who take seriously the founding principles of this nation, education also serves to help us live up to the promise contained in our founding documents. To borrow from former Texas congresswoman Barbara Jordan's famous phrasing, to ensure that every American is included in "We the People." This is not just accomplished with access to good schools, but by curricula which instill the core values and habits of mind required by a democratic society. Public education serves a public purpose, but it also has to have the support and confidence of that public. An education system which allows our schools to be divided and fragmented, reflecting and reinforcing the historical inequalities and injustices of our society, cannot serve the public's interest in a durable and functional democracy. Nor can it have the confidence of the public, as those who feel badly served grow angry at persistent inequalities and injustices, and those who currently enjoy vibrant schools worry about whether the public system can continue to support such quality. Schools that serve only some students and communities well cannot truly fulfill the public purpose of public education. The currently fashionable approach essentially offers lifeboats to a few, which undercuts the very purpose of public education. That is clearly not the answer. But can we, as a people, commit ourselves to doing what is necessary to ensure that every child, in every community, has access to a rich and meaningful education? Can we even agree on what that might be or what steps are needed? If we cannot commit, or agree, then we risk turning our backs on the fundamental promises that hold our country together. A wise colleague urged me to leave my readers with an action they can take. On the micro level, one approach is precisely that taken by Ms. Mykytyn's group Integrated Schools: working - respectfully and intentionally - to integrate public schools. Sometimes that means asking parents to seriously consider their own neighborhood schools; other times it means encouraging families to seek out a more diverse school. As we often argue, the system we have today means that one family's decision to leave a public school actually erodes the quality of the school for those still attending it. Instead of building lifeboats, why not try to build resilient communities? Integrated Schools advocates something they call the "Two Tour Pledge," where they ask parents to at least go visit two schools where the majority of students are from a different ethnic background from your own. Visit, ask questions, tell other parents what you found. No matter where you end up sending your child, it behooves all of us as citizens in our community to see the reality of what our public schools are doing - not depending on test scores, or media reports, or gossip. Get the real story. On the macro level, of course, is the work we have all been doing for some years now: trying to ensure that all schools have sufficient resources, and that students and communities which need extra help actually get more rather than less. But doing that will require a change in the way Michigan residents (and all Americans) think and talk about public schools and public education. We will have to embrace the idea that we are all in this together, that our world is not entirely one where "it's your misfortune and none of my own." We will need to remind ourselves that spending resources on everyone's children brings benefits to our entire community. And we will need to acknowledge that, sometimes, what we have meant by "our community" has had more to do with whether people look and sound like ourselves rather than who our neighbors are. To win the fight for excellent public education, we will need to overcome the divisions still lurking between ourselves. Robert K. Nelson, LaDale Winling, Richard Marciano, Nathan Connolly, et al., “Mapping Inequality,” American Panorama, ed. Robert K. Nelson and Edward L. Ayers, accessed November 2, 2017, https://dsl.richmond.edu/panorama/redlining/#loc=11/42.3474/-83.1363&opacity=0.8&city=detroit-mi.